Our company has a rich history of taking an active role in the communities we serve. For us, it means more than offering residents a sensational shopping experience. It means enriching neighborhoods through charitable giving. Offering support for community enrichment programs in the communities we serve. Please send your request to the general manager at the Lunds & Byerlys in your community. Offering grant support to a limited number of 501(c)3 organizations to support programs that focus on healthy living, nutrition and disease prevention, children’s education, and medical and emergency assistancefor those less fortunate. For every reusable bag we use to bag your groceries, we’ll make a 5-cent donation to locally-based Second Harvest Heartland, the Upper Midwest’s largest hunger relief organization. 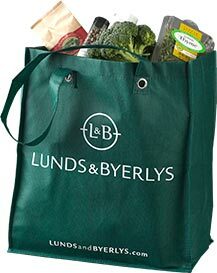 Lunds & Byerlys reusable bags can be folded and snapped into a compact square for easy storage in a purse, briefcase or backpack. Each bag costs just $1.50. If you are with a multi-community, non-profit social organization and are seeking a sizable grant contribution, please be sure to include a copy of your 501(c)3 status along with your request. Because of the large volume of requests we receive, please allow up to six weeks for a response. Individuals: All of our donations benefit individuals, but our donations go to organizations. Scholarships: We provide scholarships to our employees through the Russell T. Lund Scholarship Program.